n Pontotoc, Mississippi, the Amish way means a chance to rebuild, renew, and rekindle a love from long ago . . .
Fifteen years. That’s how long it’s been since Hannah McLean set foot in the Amish community where she was raised. Through it all her heart has never forgotten Pontotoc—or Aaron Zook, her first love. Now widowed, and left with little more than her hurting teenager and her prayers, she returns home, even knowing she and her son may be turned away. I felt I was walking in the door with Hannah as she comes back home under dire circumstances in A Home for Hannah. Amy Lillard's detailed descriptions painted the picture for me of how this sect of the Amish live and play. That plus her descriptions of the family and how they interacted with each other kept me turning the pages. 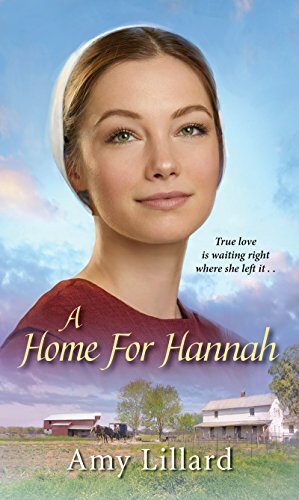 I loved reading about Hannah and the struggles she goes through trying to find her faith and hopefully her love once again. She always put her son first in every circumstance like all Mothers do. Only wanting the best for him she always tries to find a workable solution for her family first. I can't wait to read more from this series. There were so many great charactors and I want to know about each one!